BURNS, Ore. -- Harney County Sheriff David Ward has had enough. To him, the armed protesters -- many of them not Oregonians -- occupying federal buildings in a nearby wildlife refuge are only trying to help themselves, and not the local Hammond family, whom they claim to be there to support. At a short press briefing in Burns on Monday, CBS affiliate KOIN-TV reports Ward said there are about 7,000 people who live in Harney County, "most of them in Burns and Hines." He said the militia takeover has "significantly impacted our community." "I want to directly address the people at the wildlife refuge: You said you were here to help the citizens of Harney County. That help ended when a peaceful protest became an armed and unlawful protest," Ward said. "The Hammonds have turned themselves in. It is time for you to leave our community. Go home, be with your own families and end this peacefully." 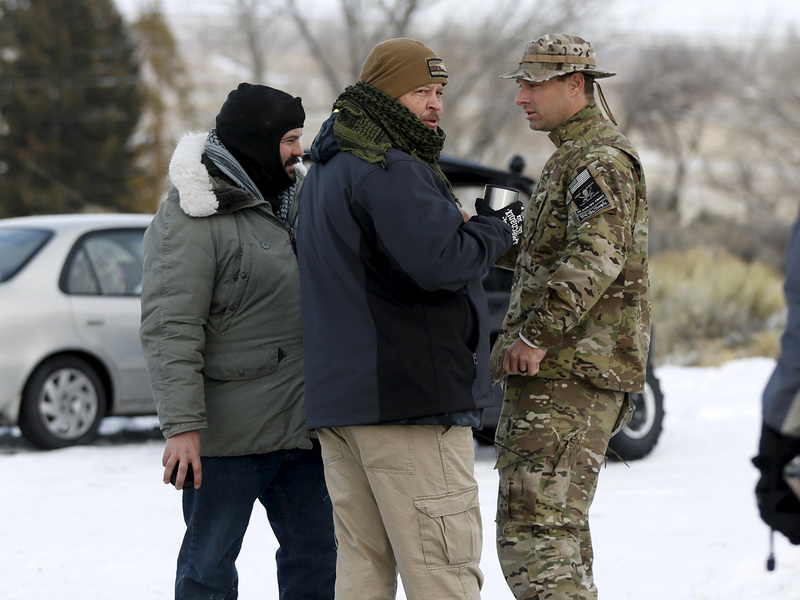 Why haven't federal authorities stepped in to put an end to Oregon standoff? The armed activists who flocked to the Malheur National Wildlife Refuge to take a stand against the federal government also looked prepared for a nippy day of hunting or fishing. They were bundled in camouflage, plaid shirts, ear muffs and cowboy hats in the bleak, snow-covered high desert of eastern Oregon where they seemed more likely to encounter a bird or animal than a member of the public outside their own group or the throng of news media beyond the pickup trucks blocking the entrance to the refuge. That may be one of the main reasons law enforcement hadn't taken action Monday against the group numbering close to two dozen who were upset about the imprisonment of father-and-son ranchers who set fire to federal land. "These guys are out in the middle of nowhere, and they haven't threatened anybody that I know of," said Jim Glennon, a longtime police commander who now owns the Illinois-based law enforcement training organization Calibre Press. "There's no hurry. If there's not an immediate threat to anyone's life, why create a situation where there would be?" Ammon Bundy told reporters Tuesday at the Malheur National Wildlife Refuge that ranchers, loggers and farmers should have control of federal lands. He is a son of Nevada rancher Cliven Bundy, who was involved in a high-profile 2014 standoff with the government over grazing rights. Ammon Bundy offered few specifics of the group's plan. LaVoy Finicum, an Arizona rancher, said the group would examine land ownership transactions to begin to "unwind it." Finicum says authorities hadn't shut off power to the refuge's headquarters as of Tuesday morning. Schools were closed for the week in Burns, about 30 miles north of the refuge, out of an abundance of caution, but no one had been hurt and no one was being held hostage on Monday. The takeover puts federal officials in a delicate position of deciding whether to confront the occupiers, risking bloodshed, or stand back and possibly embolden others to directly confront the government. The group -- led by two of the sons of rancher Cliven Bundy, who was involved in a 2014 Nevada standoff with the government over grazing rights -- sent a demand for "redress for grievances" to local, state and federal officials, and gave them five days to respond. They have not said yet what they will do if no response is forthcoming. "We have exhausted all prudent measures and have been ignored," Ammon Bundy said. The group, which included a couple of women and some boys and girls Monday, did not release a copy of its demands. President Barack Obama said Monday federal authorities were monitoring the situation, but agents made no apparent moves to surround the property or confront the group - an approach that reflected lessons learned from bloody standoffs at Ruby Ridge, Idaho, and Waco, Texas, in the early 1990s. That prompted complaints from many observers who suggested the government's response would have been swifter and more severe had the occupants been Muslim or other minorities. "There seems to be somewhat of a reluctance to think white people are as dangerous as people of color," said Heidi Beirich of the Southern Poverty Law Center, which tracks hate groups. Beirich said the group was emboldened by the government's failure to hold Cliven Bundy or his supporters accountable in 2014 after hundreds of armed anti-government activists rallied to his defense when federal authorities started seizing his cattle over more than $1 million in unpaid grazing fees. "You can say, well, a negotiated settlement emboldens them," he said. "But by the same token it deprives them of a confrontation that some of them want." Oregon Sen. Ron Wyden says "outsiders" are to blame for the situation. Wyden told The Associated Press he had been briefed by Gregory Bretzing, the FBI special agent in charge in Portland, Oregon. Wyden says the FBI is coordinating with state police and the Harney County sheriff's office, but he declined to offer further details. The Hammonds have distanced themselves from the protest group and many locals, including people who want to see federal lands made more accessible, don't want the activists here, fearing they may bring trouble. In the 1970s, Nevada and other states pushed for local control over federal land in what was known as the "Sagebrush Rebellion." Supporters wanted more land for cattle grazing, mining and timber harvesting and opponents wanted federal government to administer lands for the widest possible uses, including environmental and recreational. Ammon Bundy said the group plans to stay at the refuge as long as it takes.